For the last seven summers runners have loved this out and back course, with a loop in the middle, and we are gearing up for a bigger and better race in 2019! We’ll continue to offer our 10K out-and-back option also! The race starts at Essex High School before bringing racers to the country back roads of Essex. At mile 4, runners will encounter a one mile incline and leg burn while trying to conquer Curve Hill. Runners will feel the comfort of the dirt roads as they run their way up and down the hills of Lost Nation Road. The turn-around spot is the end of Lost Nation Road, at the intersection of Old Stage Road. Runners will continue back on Lost Nation Road before cruising down Lamore, back onto Colchester Road to Old Colchester Road, towards the finish. Racers will hear the roar of the crowd cheering as they sprint to the finish with their friends, loved ones, and fans to cheer them on. The cutoff time for this event is 3 hours. 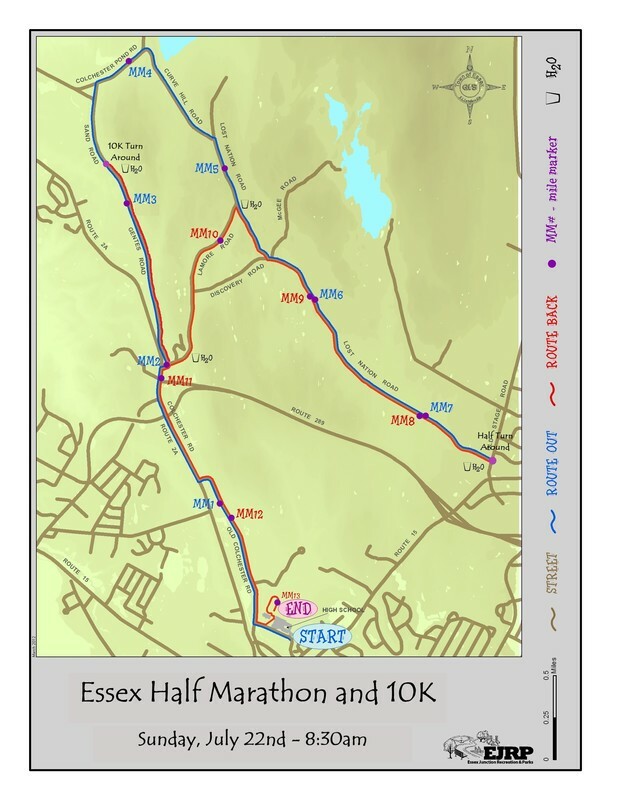 The Essex Half Marathon is a certified course. Certification code VT12012JK. This is not a walking event! To ensure the safety of our runners and volunteers and to re-open closed roads, there will be a time cut off of three hours. If a runner hasn’t reached the 7 mile mark by 10 a.m., we cannot guarantee support through the remainder of the course–meaning aid stations will close and you will not be officially timed. Runners may be asked to remove themselves from the course. 2 Educational Drive, Essex Junction, VT 05452. There is plenty of parking at the EHS parking lot. Yes, there will be a bag check set up in the Essex High School Ice Rink. After the race bags will be available at the same location. Note: We are not responsible for lost or damaged property. There will be five water stops, located approximately at 3 miles, 6 miles, 7.75 miles,9.75 miles and 11 miles. In addition to bathroom and locker-room facilities at Registration, near the Start, and Finish area ,there will be two port-a-potties located near the turnaround area at the end of Lost Nation road. Runners will enjoy a variety of delicious food and drink items at the post race party which runs from 10am-12pm. There are awards for top overall finishers, female and male, as well as age group winners. Awards go three deep, with 10-year age groups increments. You must be present to receive your award (awards will not be mailed out afterward). This race will be chip timed by 802 Timing.